SAI believes in offering the best possible global opportunities to its students, staff and administration. The Global School Partnership (GSP) Programme under Global Dimensions has four very dynamic principles including student’s all-round global exposure, professional development of teachers and staff, embedding a sustainable international dimension into the school curriculum and inclusive education through community service. SAI has been working with students of various Schools across the globe, through regular video conferencing, collaborative international partnership projects and the Global Immersion Programme. 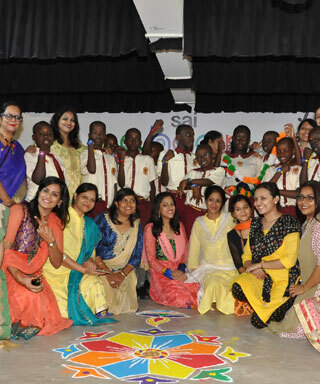 Under this partnership SAI teachers and students visit their partner schools for up to five days with home stay. In reciprocation SAI hosts teachers and students from their partner schools each year. An element of global connect is added through planned community service initiatives that benefit the underprivileged in each country. Joint international projects are also incorporated into this program on a range of topics including commerce, culture, social sciences, economics, math, languages (English, Mandarin and Luganda) and music. These projects can range from one week to one year depending on the requirement. SAI being a global educational mentor, helps schools with infrastructure development, curriculum building and teachers continued professional development. As a British Council Ambassador school we advise our international partner schools about British Council programmes that will benefit their teachers and students including the International School Award. Partner Schools in UK include Chosen Hill School and Churchdown Village Infant School, Gloucester. Our USA link schools are Farmington High School located in Connecticut, Dr. Phillips High School located in Florida, Union Charter Academy located in North Carolina and several schools in Cupertino, California as part of the Cupertino Bhubaneswar Sister City Initiative which links educational institutions, businesses, and government organizations between the two cities. In Uganda we have partnered with Gombe Group of Institutions which is in fact three schools, Scooby – Doo Day Care and Nursery, Gombe Junior School, St Andrews Kawgga Gombe High School. In China we have link schools in Kunming, Beijing and a signed MOU with Fuzhou Foreign Languages School in Fujian Province. SAI Angan has a broad International outlook and will continue to cultivate its list of global school partnerships until we have school links with every country.